What is it with these new guys in F1? Ignoring the astonishing talent of Lewis Hamilton, who grabbed pole position yesterday for the Indy GP, there are so many others putting in surprising performances. Sebastian Vettel added his name to the list in practice and qualifying, always in the top ten quickest and pushing Heidfeld hard. His grid position, seventh, may not sound that great but consider who he is competing against. Naturally the first four slots are occupied by McLarens and Ferraris and Quick Nick claimed fifth; Heikki Kovalainen renewed his sagging reputation with sixth, probably with a very light car, but then comes Vettel. Even if he was light too, that is evidence of serious talent in one experiencing his first Grand Prix. Vettel may be Mario Theissen's protege but the rookie has given him a big headache with this showing. What does the BMW team boss do now? In the past, he has shown that he is quite prepared to unplug one driver midseason and slot in another; but the choice between Kubica and Vettel becomes even more difficult in these circumstances. Heidfeld is safe for this year at least - he is still beating his team mates and leading the BMW charge for honors. But it's the kind of problem every team manager would love to have: too many very talented drivers and only two race seats. Toyota would give anything to be in the same situation, I expect. Elsewhere, Kovalainen seems to have made some sort of breakthrough at Renault. He looked very quick throughout Friday and Saturday and then helped his team leader, Fisichella, to make it through to the top ten in qualifying - amazing what a bit of a tow can do. Davidson, too, had the upper hand over his team mate this time around and may be over his bad luck spell at last. And Sutil continues to outperform Albers, reinforcing the impression that this year's crop of rookies is something very special. Has there ever been a season when so many newbies entered the sport and immediately shone? I think not, especially when remembering that Gary Paffett, Timo Glock and Sebastien Bourdais wait in the wings. There is no doubt about it, the times they are a-changing. Expect more well known names to disappear next year and a new era to be ushered in. And the new names will stay a while too; there are no obvious talents in GP2 and other formulae at the moment and it is unlikely that serious challengers will arise from them in the near future. Truly, this has been a bumper year for rookies. Something similar has happened in British Superbikes this year, there's been an infusion of rookie drivers and some of them are amazing. Jonny Rea (who won today at the Irish round), Leon Camier (me and Pooties favourite) and Cov lad Cal Crutchlow have all been dicing with these gnarled ex World Superbike riders and giving as good as they get. It's got to be a good sign for any sport when the next generation rock. Being on the wrong side of the world, i don't get to see much motorsport nowadays. Is Lewis Hamiltorn really as talented as the press make out or is he just in a good car? 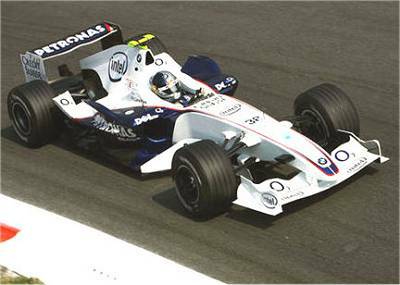 Yes his points tally is impressive so far but then so was jaques villeneuves and i always thought he was over rated. I have never seen such a flood of obvious talent in F1 before, Mad. It really is something unprecedented. And that Vettel guy is as good as Hamilton by the looks of things. Amazing. Hamilton is no Jacques Villeneuve, Keef - this guy is the real deal. When Jacques came into F1, he wasn't teamed with the champion of the previous two years, a champion who had beaten Mickey the Shoe and the Kimster to get there. Alonso is very, very good but Hamilton is already just as good and can only get better. He has it all: incredible talent, cool head, realistic attitude, racecraft, car control, precision, humility, luck, everything. If you decided to design the perfect F1 racer, you'd end up with Hamilton - the lad has no flaws that I can see. I would say more but the genuine F1 fans are heartily sick of the Hamilton hype in the Brit press and are almost turned against him as a result. Sure, the car is good and getting better (the Ferrari was the best until the last three races) but Lewis would shine any car. He really is that good. No obvious talents in GP2? What about Timo Glock? OK, apart from that, the field looks pretty thin on talent, but I think its worth at least keeping one eye on Filippi, Maldonado and Senna. Still think Alvaro Parente is worthy of further attention, too. I included Glock with this year, Patrick, because he is already under contract with an F1 team. I admit to forgetting Senna, however - he must be one to watch if only for the genes. So he's the real deal then. I hope the young fella does well. It's about time we had some home grown talent rather than the home grown hype we usually manage to produce.